When I was a kid and it got above 90 degrees, my parents would put out a sprinkler in the lawn and my brother and I would spend hours running back and forth through the water. My parents would work in the garden on weekends, watching us tire ourselves out. When we felt especially daring, my brother and I would recruit our friends and walk through a wooded alley between our neighbors’ yards. Our parents chastised us since we were technically trespassing, but the adventure was too much to resist. My last four summers have been spent working — either as an unpaid intern at a research lab or at an engineering company spending hours in front of a computer. I no longer relax outside daily — instead, tired from a day’s work, I head to sleep early. With summer break just around the corner, we as students all hope to free ourselves from the clutches of final exams that force us to scrounge for study spaces in Hillman. We hope summer brings us time at the beach, time in nature, time to live without responsibilities. But dreams of a summer filled to the brim with relaxation are quixotic. The traditional, ideal American summer is dead. And it’s primarily a result of the commodification of education, which has made it nearly impossible live without worries. The commodification of education manifests itself in our society primarily with the sheer cost of attending college. Students are saddled with debt due to exorbitant tuition prices, with public schools typically costing around $8,000 per year and private schools hovering around $21,000. And these costs do not factor in living expenses, which can add more than $10,000 per year, depending on the city. The situation is even worse at Pitt. Pitt is the most expensive public school in the country, partially due to relatively low state funding and its origin as a private school. As a result, Pennsylvania has the third-highest student debt in the country, with Pitt students owing an average of $36,466 after graduation according to 2015 data from the Institute for College Access and Success. And this issue will only get worse over time. Nationwide, the cost of attending college have skyrocketed, increasing by 1,120 percent since 1978. At Pitt, Pennsylvania residents saw an increase of $442 for this school year, while out-of-state students experienced an increase of $864, a trend that’s consistent from year to year. In an attempt to combat their growing debt, students work long hours through the summer to pay for their education and living expenses for the following year. Roughly four out of five students hold a job during the school year, working an average of 19 hours per week, and these numbers are certainly higher for students working over the summer. Simultaneously, the commodification of education has also impacted how students think they should use their summer. The objective of college education nowadays is to begin a prosperous career. It’s not learning for the sake of learning — it’s learning to be successful in life. This view on education negatively influences how students spend their time over the summer. 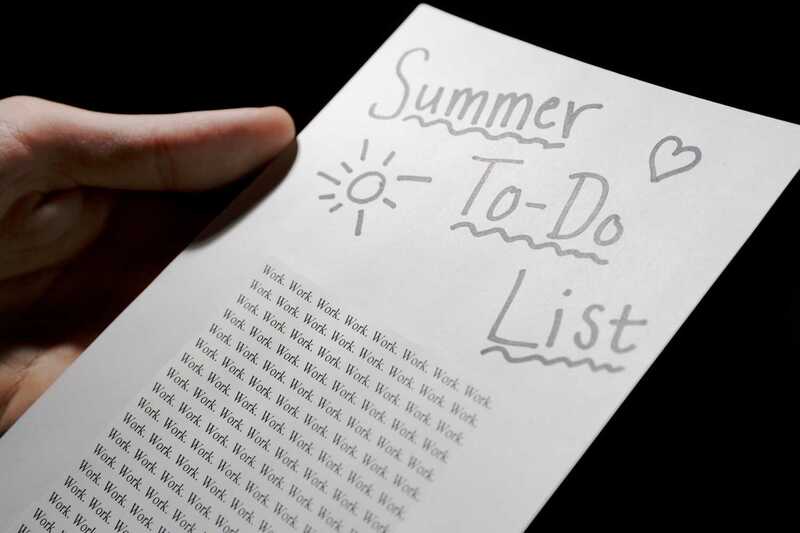 Many students believe that unless their summer is just as busy as the school year, their offseason is unsuccessful. This is what pushes more than 80 percent of college students to participate in summer internships. Many of these internships are unpaid and these have questionable value given the comparable hiring rates of students with and without an unpaid internship. It’s also what pushes students to fill their summer with more classes in an attempt to knock out general education requirements or other classes in their major. The focus on summer work is detrimental to the traditional feel of summer. Part of summer should be about being outside, relaxing and living carefree. Forty-hour work weeks, coupled with other involvements outside of work, prevent this from happening. Going outside and relaxing don’t just preserve the traditional spirit of summer — they also have proven benefits to mental health. Two studies from researchers at Stanford University in 2015 showed an overall improvement with participants’ mental health after a walk in nature. These walks reduced anxiety and improved focus, something that many students could benefit from. It is true that we are college students on the way to becoming working adults, so we can’t expect to have carefree summers forever. But at the same time, we spend eight months of the year stressing over assignments, group projects and exams. Summer is the only reprieve outside other shorter breaks from this work, and we should take advantage of it in every way we can. But to make this way of experiencing summer possible, we would need to rebel against an education system that has thoroughly permeated our society. And given the inertia associated with an institution like education, this is difficult to do. What we can do as students is change the narrative surrounding college education. We can verbally protest rising college costs and the paradigm surrounding the working experience at college. We should also recognize that maybe we can replace part of our summer Netflix binge with time outside. The next season of your favorite show can wait — it’s only warm and comfortable for a few months. In the same vein, not every outside experience needs to produce an Instagram-worthy picture — it should be enough to simply be outside. It’s unrealistic to expect a summer entirely free from responsibilities. But we should do everything we can to get closer to this ideal for the sake of our own mental health.